The Iron Horse Hotel in Milwaukee hosted the inaugural Adopt MUTTwaukee event on Saturday, June 15. Described as a doggie social and adoption event, the pet-friendly hotel welcomed not only pets and their people but also organizations dedicated to our four-legged friends. Stella & Chewy’s, co-sponsor of the event and Milwaukee manufacturer of natural, raw food for dogs and cats, dished out advice (and food samples) to pet parents. Whether or not your dog suffers from allergies, he can benefit from a raw-food diet, and the very informed Stella & Chewy’s representatives were there with advice on how to easily feed your dog a new diet. A stop at the Canine Cupids rescue booth (“a dog for every lap!”) allowed patrons to meet adoptable cupids. And for just $3, you could adorn your dog’s collar with a handmade “ugly dog tie” – perfect canine formalwear! All proceeds benefited Hailey, a cutie rescued from animal control who is now awaiting much-needed surgery. After seeking advice from two vets, she’ll have a front leg amputated due to a break that healed poorly. Stephanie Bartz Photography snapped photos of dogs and their people on the front steps of the hotel. Brew City Bully Club had adoptables and offered a chance to buy a raffle ticket prior to their annual Rescue Ride. Others in attendance included the non-profit Seniors Rock! (where “love has no age limit”), Milwaukee Animal Rescue Center, Native Dogg, ROMP (Residents for Off-Leash Milwaukee Parks) and more. For more information about the hotel and to view what awaits your dog on an overnight stay, visit http://www.theironhorsehotel.com/packages/the-iron-horse-hotel-big-dog-package.html. The National Association of Professional Pet Sitters (NAPPS), a nonprofit organization dedicated to promoting the welfare of animals, is urging pet parents to take the proper precautions to help protect their furry friends from the dangers of Lyme disease. According to the Center for Disease Control (CDC), Lyme disease is a bacterial infection spread through the bite of slow-feeding, hard-shelled deer ticks. Borrelia burgdorferi, the bacteria responsible for the disease, causes infections in both humans and animals. Although ticks are active year round in temperatures above 40 degrees, the CDC reports that the most Lyme infections occur during the months of June, July and August. you feel and rub slowly. A small bump may be a tick trying to hide. areas or in other humid areas where ticks thrive. can pick up nose ticks on a walk because of sniffing. Fold back ears to see inside the ear opening and use fingers to feel gently around this area. Lots of fur or different skin colors could disguise a hiding tick. Give your pet a bath regularly. Watch pets that shake their ears, scratch oddly, bite themselves or are restless. NAPPS encourages pet parents to familiarize themselves with the preventative tips offered by the CDC; understanding the harmful effects of Lyme disease and methods for preventing the infection are the first steps in protecting your four-legged loved one. About NAPPS: NAPPS is the only national non-profit trade association dedicated to serving the needs of professional pet sitters. The Association aims to help the pet owning public, those interested in pet sitting, and professionals engaged in the in-home pet care industry by fulfilling its vision statement, serving as “the most respected authority in professional pet sitting.” It does so by providing the tools and support to foster the success of its members. Additionally, pet parents can benefit from NAPPS’ free resources including a disaster preparedness guide, tips on how to select a pet sitter, and a nationwide referral service,. To find a pet sitter in your area, check out NAPPS’ nationwide “Pet Sitter Locator” at http://www.petsitters.org/. For more information on NAPPS, please follow @TheNAPPS on Twitter or join us on Facebook at facebook.com/TheNAPPS. un and a 1 or 2 mile walk – dogs welcome! Nicole Koglin, Anchor for “FOX6 WakeUp” and “Real Milwaukee,” will emcee! $30 day of (T-shirt availability or size is not guaranteed for day of registration). $25 day of (T-shirt availability or size is not guaranteed for day of registration). Children 13 and under are free for both the run and walk! A commemorative Walk, Run, Wag for MADACC tech t-shirt, as well as a goody bag, will be provided to all paid registered runners and walkers. Medals will be awarded to the overall male and female 5K finishers, plus the top finisher in each of fourteen age groups. Lakeshore Veterinary Specialists. Milwaukee’s “Ulti-mutt day out” also benefits Friends of MADACC and will be held from 11 a.m. to 4 p.m., with FREE admission. The event will include a wide array of vendors, canine activities, lure coursing, dock diving, live music, food, a beer tent, demonstrations, adoptable animals, kids’ area, and more. Did you know that a microchip can become inoperable if it’s touched when your cat or dog gets a shot? Find out if your dog’s microchip is still working! Lost Dogs of Wisconsin will be conducting free chip checks at Fido Fest’s “Safe and Found” booth. Fido Fest attendees can purchase a microchip for $20. Walk, Run, Wag participants will receive a discounted price of just $15! MADACC will also offer pet I.D. tags for $5. Visit http://www.madaccwalkrun.org/ to register and stay up to date on all of the event details. Learn more about Fido Fest at www.centralbarkusa.com/fidofest. 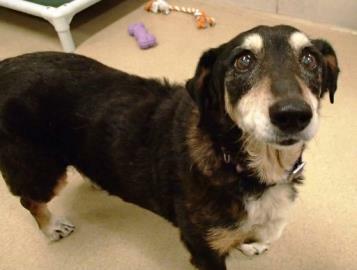 Milwaukee – A 10-year-old Corgi mix originally from Oklahoma needs some extra help finding a home at the Wisconsin Humane Society (WHS). Honey was transferred to WHS’s Milwaukee Campus from a shelter in the Oklahoma City area after May tornados caused so many dogs to become homeless or separated from their families. Honey had already been at a shelter; therefore, shelter workers in Oklahoma knew that no one was missing her – so Honey boarded a truck with 20 other pups bound for Milwaukee. She is one of the last dogs from that transfer to be adopted. And officials at WHS say they need a little help finding a great home for Honey. “Honey is the sweetest dog, and she has some chronic medical issues that will need to be managed in her new home, including chronic arthritis, dental issues and cataracts,” said Angela Speed, director of community relations and development at WHS. “We also suspect that she may have some additional underlying conditions that will need further tests to diagnose. We do not have the specialized medical equipment to do those tests at the shelter, and it will be much better for Honey to be treated while relaxing in a permanent home environment, as well. Honey will be going home with a special voucher for medical care to get her started on the right track,” Speed said. Honey’s blood work was normal and x-rays revealed that she may have respiratory and possibly cardiac issues. Honey hasn’t shown any symptoms of being in any pain; however, she would really benefit from seeing a veterinary specialist to determine the best course of care for her. On Sat., Aug. 17, from 8 pm to midnight at Shank Hall, 1434 N. Farwell, fans can pay tribute to late Milwaukee punk-rock icon (and animal lover) Richard LaValliere (1952–2012) at “Requiem for Richard / Rover Rescue,” a rockin’ cinematic/musical program that’s also a fund- and awareness-raiser for the Wisconsin Humane Society (WHS). Says program organizer Paul McComas, a Milwaukee-born author/filmmaker, “As a teen in the early ’80s, I was a huge fan of Richard’s brilliant art-punk band the Oil Tasters; during the last years of his life, I was honored to become his friend and collaborator. Now, 18 months after his far-too-early passing, his family members and I have joined forces to honor his memory with a punky multimedia event benefiting WHS that will be as unique as Richard himself.” A “Requiem …” highlight will be the world premiere of McComas’ 48-minute film Time Trek, for which LaValliere composed and performed the original “SoundTrek” music—his final creative work—and in which Richard played “Leader of the Cave People.” The eighth installment in McComas’ national- and international-award-winning No-Budget Theatre cult-film series, the “Star Trek” homage/parody began shooting in Milwaukee 37 years ago by 14-year-olds “but couldn’t be properly finished,” McComas says, “without RLaV’s masterful music and scary/funny onscreen swan song.” Time Trek cast and crew members will be in attendance. Admission to this 21-and-over show is $10, with all proceeds going to the WHS. In addition, copies of the limited-edition (250 numbered copies) Time Trek two-disc (DVD/CD) set will be available for purchase at $15 each, with all profits going to the WHS. The Wisconsin Humane Society (WHS) Ozaukee Campus is pleased to announce Feasting for Felix, a fundraiser to benefit the homeless animals at the shelter. This event on Thursday, June 13 from 6:00 p.m. to 9:00 p.m. will include vegetarian tastings of creative cuisine prepared by Ozaukee County’s best restaurants, beer and wine, live music by String-A-Long, and a silent auction. Advance tickets are $40 for adults, $75 for couples, and $20 for children under 12 years old. Tickets can be purchased at the shelter at 630 W. Dekora Street in Saukville, or online at http://www.ozaukeehumane.org. At the door, tickets are $50 for adults and $25 for kids. The list of participating restaurants include: Café 1505, The Centennial, Firehouse, Amy’s Candy Kitchen, Ferrante’s, Tello’s, Highland House, Riverview Inn Pizza, Fire Ridge Golf Club, The Chancery, Zaffiro’s, The Anvil, Remington’s River Inn, Harvey’s Central Grille, Cedarburg Coffee Roastery, and First Watch Mequon. Beverages are being donated by the Chiselled Grape Winery, Pabst Brewery and Lakefront Brewery; sponsors include Sommer’s Subaru, Port Washington State Bank, Charter Steel, Milwaukee Radio Alliance, LLC, Saukville Veterinary Clinic, G.A.L.S. Inc., and the Wisconsin Veterinary Referral Center.